We recently had the pleasure of hosting our friends Joan and Beverley from the UK. Both Joan and Bev worked in the office of the school in London where I was teaching in the olden days. They have been loyal and true friends from the day we first met and I love that our friendship has withstood both time and distance. Even though Joan and Beverley were the ones who had travelled on vacation, I felt like I was on holiday too, because there’s nothing I love more than hanging out with my favourite people, than being a tourist in my own town. I had a list of foods I wanted them to try that was as long as my arm and I was beginning to wonder if we’d have the time, never mind the stomach space to fit it all in! As it turns out Joan and Beverley were the perfect house guests, and not just because they ate everything I offered them and slept like logs. I was especially pleased vis a vis the sleeping situtaion. which meant I could get on with my favourite early morning (not to mention noisy) activities, namely making coffee and baking, without waking the sleeping beauties from their slumber. It became a bit of a standing joke because every day the delicious smells coming out of the kitchen would wake them before the noise would! 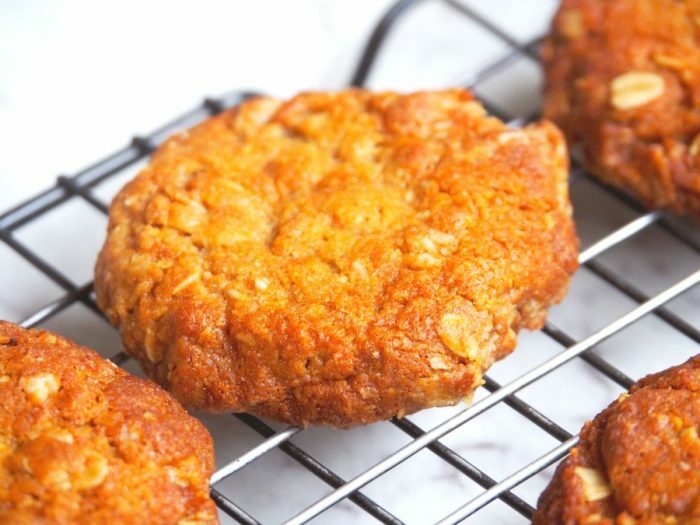 Neither Joan nor Beverley had ever tried an Anzac biscuit before and I was keen to rectify this situation with haste. 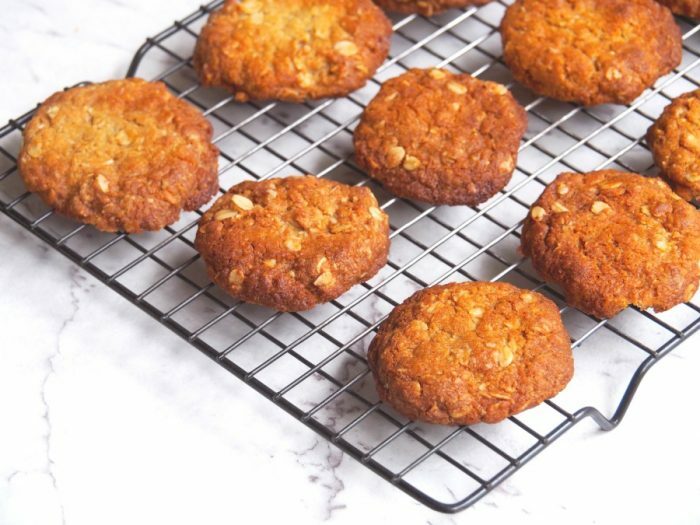 When life gives you Anzac biscuits, early in the morning and fresh from the oven, you eat them for breakfast. At least that’s what we did anyway. I am pleased to report that Joan and Beverley have fallen for these delicious oaty morsels as hard as I have. Joan says they remind her of a biscuit she ate as a kid and Beverley thinks they taste like homemade Hobnobs. 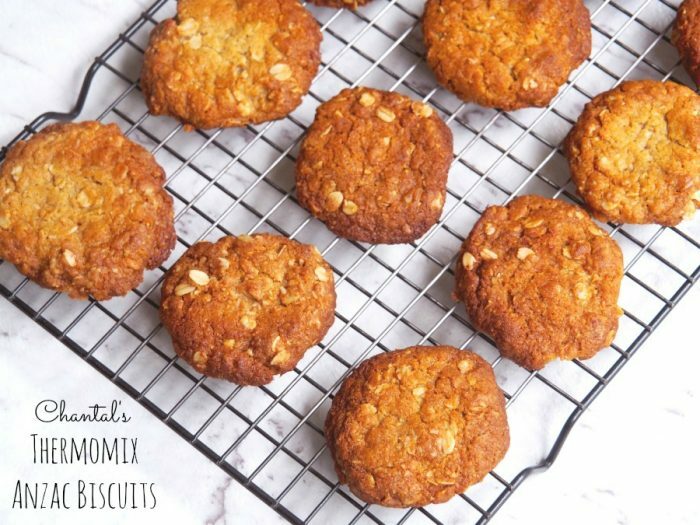 So that was how they tasted their first Anzac biscuit, but I know it won’t be their last! I adapted this from Chantal’s original recipe, that she adapted from her high school recipe book. It’s a keeper! 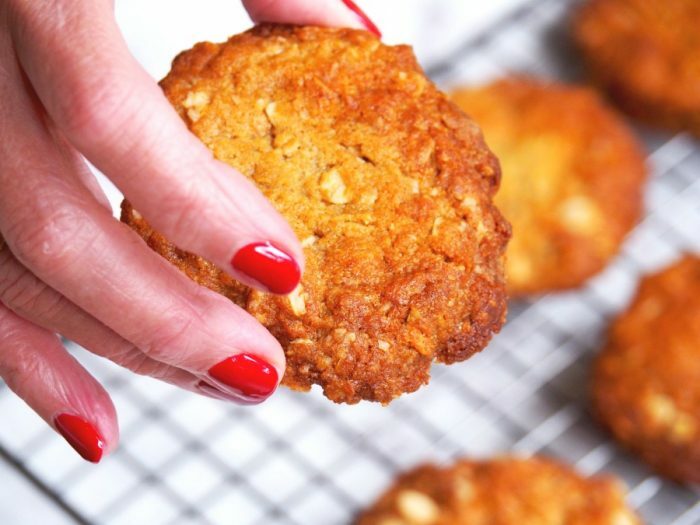 Can you remember the first time you tasted an Anzac biscuit? Are you an early riser too? Preheat oven to 160C/140 fan-forced. Line 3 baking trays with baking paper. Add butter, golden syrup and water to the TM bowl. Mix for 2 minutes at 70 degrees on speed 2 or until fully melted. Add bi-carbonate of soda and mix for 5 seconds on speed 3. Add remaining ingredients and mix for 20 seconds on reverse speed 2. Roll tablespoonfuls into balls and place on lined baking trays. Press lightly with back of spoon. Allow room for spreading. Cool on trays for a couple of minutes before moving to cooling racks. Store in an airtight container. TIP! Use a teaspoonfuls of mixture for smaller cookies.